Although we are now back up to six years of hurt I didn’t begrudge Essex their Championship title last summer. Even a supporter as one eyed as I am would have to concede that the Red Rose was a distant second, and more importantly that Essex played consistently well in 2017 and thoroughly deserved their (to most) unexpected success. In recent years a book to celebrate the Championship winners’ summer has often put in an appearance. It isn’t difficult to see why. The books do not need a huge amount of research, and whilst the appeal might be limited the core of the county’s supporters can usually be relied upon to buy the book in sufficient numbers to justify the exercise. The last time Essex lifted the county game’s major prize was as long ago as 1991, so the publication of a book to celebrate their achievement came as no surprise to me. I expected a collection of reports and interviews from the local press, a selection of scorecards and statistics and a generous allocation of photographs. With hindsight there was a clue that Essex County Cricket Club Memories was not going to be from that sort of formula, that being that its release date was never going to catch the Christmas market, and the relatively easy sell for such souvenirs that that tends to create. In fact the book could not be more different from a run of the mill account of a summer’s endeavours. It is a unique celebration of a county club and, hopefully, will be paid the ultimate compliment when all the other counties produce something similar. The idea for the book began with a questionnaire being circulated amongst supporters, and their thoughts on the various questions that they are asked form its core. The contributions range from a single sentence to several paragraphs. Skilful editing, to avoid repetition, is obviously essential, and has been very well done. The glue that then holds the book together is 25 interviews with past and current players. To give an example one of the questions asked was on the subject of who the respondent’s favourite Essex overseas signing had been. The age range of the contributors is wide, but the average age must be, shall we say, fairly mature. A not inconsiderable number of those who responded clearly had first hand experience of seeing every overseas signing the county has had, and that goes back to 1968. The majority opted for the South African Ken McEwan which, given that the county have at various times had Mark Waugh and Allan Border on their books might surprise some. A stylish and prolific batsman McEwan, who provides one of the interviews, was denied a long Test career only by virtue of South Africa’s exile from the Test arena. Reading about him here reminded me how good he was to watch in his pomp. He was one of those cricketers, Barry Richards and Clive Lloyd were two more, who generally looked at his best when there were television cameras around. As a neutral my own favourite Essex overseas player would, in political parlance, be returned by a landslide, and I was delighted to see that a fair number of Essex supporters agree with me. One of them said it all in a sentence, justifying his selection by referring to sheer exuberance and enjoyment of the game. The man referred to? It could only be Keith Boyce. A hard hitting batsman, genuinely fast bowler and quite breathtaking fielder Boyce would be a big hit today – fifty years ago he was a revelation. Unsurprisingly Boyce also gets plenty of mentions in the favourite all-rounder category. The other questions will come as no surprise. Favourite batsman, bowler, innings, spell of bowling and match are all covered. Rather more personal to Essex is the subject of the grounds on which the county’s matches were played. Nowadays they have a headquarters at Chelmsford, but in days gone by Essex cricket was like a travelling circus. There was no permanent home and the club moved around the county taking in a number of venues. Until I read Essex County Cricket Club Memories I had quite forgotten the old travelling scoreboard. Constructed on a trailer attached to a lorry it was a familiar sight in the days of BBC2’s coverage of the old Sunday League. The book contains a couple of wonderfully evocative photographs of two incarnations of the mobile scorebox and, best of all, a shot of the interior, something that as a child I longed to see – it has taken the best part of half a century, but at last I now know what it looked like on the inside! 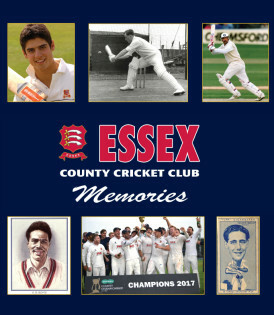 Essex County Cricket Club Memories is a coffee table type book, produced on good quality paper profusely illustrated in, as appropriate, full colour or black and white. There are some superb images here, many of which I hadn’t seen before. One of John Lever bowling in the nets with Stuart Turner in the background particularly struck me, as did those of the mobile scoreboard already referred to, not to mention photographs of Nasser Hussain and Graham Gooch looking ridiculously young. As a Lancastrian I have to admit to feeling something of an outsider looking in whilst reading this one, but I was made to feel very welcome nonetheless. I have no hesitation in saying that Hiscock and McDonald’s efforts are worth four stars to anybody who loves the county game, but for an Essex supporter I would suggest Essex County Cricket Club Memories is indispensable. The only slight drawback is a hefty £30 price tag, but then the production values are certainly a cut or two above the norm.